Sender: Hi Harold. I have a slight problem with my new Samsung Galaxy S5. Every night I let it sit on a charging so it would charge over night and has a full battery in the morning. It charges fine and the phone is performing well. However, there's one thing I really want it from doing--playing the wireless charging notification. Me: Hey Joey! Can you observe your phone a little more? What does it say when it beeps? Is the beep the same as when the phone first detects it is within range of a wireless charging field? Please let me know. Sender: Hey Harold. When it beeps it says, "WIRELESS CHARGING: You have placed the device within range. Now charging wirelessly." And yes, the beep is the same as when the phone begins charging wirelessly. Me: Thanks for providing the details, Joey. I will look into it. I will write about this, so please stay tuned. This problem has two scenarios; first, the phone is the one beeping; second, it's the charging pad that's beeping. Why would the phone beep it allowed to sit on the charging pad over night? When the phone, in this case the Galaxy S5, is fully charged it will stop charging. After several minutes, the 100% battery charge falls to 99%. When it happens, the phone will automatically recharge that's why it will pop up a notifications saying "WIRELESS CHARGING: You have placed the device within range. Now charging wirelessly." Then, the cycle repeats until the owner removes the phone from the charging pad. The other version of this issue is that the charging pad is the one beeping. That is why it is imperative the user should determine if it’s the phone or the pad that beeps. To do that, bring the volume of your phone all the way down and then place it over the charging pad. If you can still hearing beeping, it's the pad. Root your phone first. You need this to modify system files, which is necessary for this purpose. Download and install Root Browser in your phone. Go to the directory system > media > audio > ui. Find the file WirelessChargingStarted.ogg and rename it to any name you want. 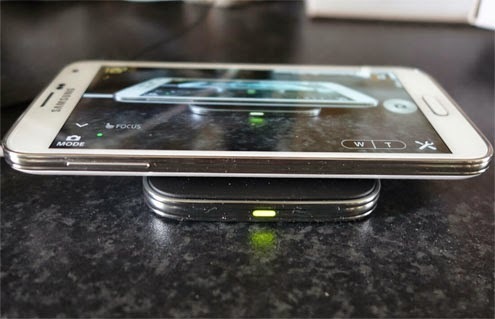 That's it, your phone won't beep when wireless charging starts. But if you want, you can find a tone you like, convert it to .ogg format, rename it WirelessChargingStarted.ogg and copy it to the same directory. Now, to prevent the wireless charging pad from beeping, you just need to open it up, find the wire that connects to the speaker and cut it. But please note that this will void the warranty of the accessory. I hope this helps. If you got questions, feel free to email me at harold@droidista.com.